Source: Journal of the Folk=Song Society. No. 7 Being the Second Part of Vol. II. (London: The Folk=Song Society, 1905), No. 33, p. 133. 33.— THE FOUNTAIN OF CHRIST'S BLOOD. ‡ See Hymns A . and M., " O, come and mourn with me awhile." William Cowper's hymn begins "There is a fountain filled with blood drawn from Emmanuel’s veins." Note that several of these are on the pages following this hymn in Volume 2, pp. 134-138. 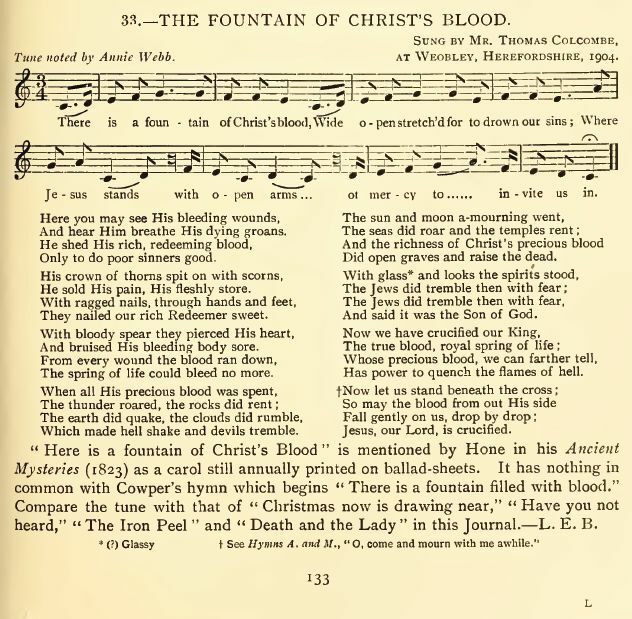 Cowper's Hymn: There Is A Fountain Filled With Blood. 25 Come All Ye Faithful Christians (Four versions with four variants of music); Come All Ye Worthy Christian Men; Come All You Worthy Christians; Come All You Worthy Christian Friends. Most of these are Christmas carols, and all contain notes, some of which are extensive.